We make available the high-grade Plastic Limit Apparatus in the Indian market. Manufactured as per the industrial standards, the Plastic Limit Apparatus is reckoned for its excellent performance and high efficiency. We offer the Plastic Limit Apparatus to the clients at affordable price. 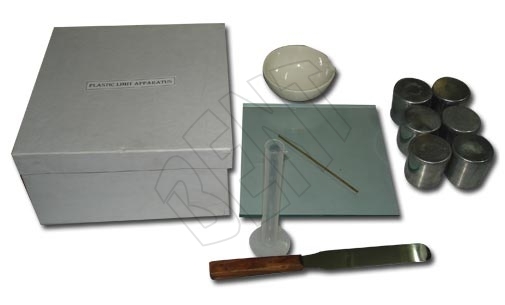 One each of plain glass pate 20 x 20cm, measuring cylinder 25ml, flexible spatula, evaporating dish, brass rod 3mm dia and 6nos moisture cans packed in a plastic box.